Understanding social media demographics—the different audiences that each platform has the potential to reach—will help you fine-tune your marketing strategy and reach the right people with the right message. The most effective social media marketers go where their audience is. And while that may seem obvious, the fact is many marketers spread themselves too thin across too many platforms. Because think about it: how many men prowl the boards of Pinterest for power drill DIYs? What are the chances Snapchatters are thinking about retirement? Could LinkedIn members be lured by video game ads? Okay, maybe some. If you already feel like you know the answer to these questions, then you’re on the right track. Continue reading to find out more about the user demographics of every major social media network. With two million monthly advertisers and eight million business profiles on Instagram it’s becoming more difficult for marketers to stand out from the crowd. Knowing these Instagram demographics will help make a difference in your Instagram marketing strategy. 71% of Americans aged 18 to 24 now use Instagram. More than 80% of these users check the platform daily, and 55% visit multiple times a day. Instagram is more popular with women than it is with men in the U.S.
43% of African Americans in the U.S. use Instagram, followed by 38% Hispanic and 32% white Americans. More than 80% of Instagram’s community lives outside of the U.S. According to Instagram co-founder and CEO Kevin Systrom, Brazil and India are fast-growing regions. Most Instagram users live in urban areas, followed by suburban and rural areas. Household income is distributed somewhat evenly among Instagram users. The amount of American users who make $75,000 or more is tied with American users who make $30,000-$49,999. 42% of U.S. adults who use Instagram have a college degree or more. For additional consideration, read 23+ Useful Instagram Statistics for Social Media Marketers or take a deep dive into more Instagram demographics. Facebook now has more monthly active users than any one country’s population. With such a massive user base, it’s vital for marketers to understand the demographic segments that matter most to them. With the exception of those 65 and older, a majority of Americans of all ages now use Facebook. In the U.S., 25-34 year-olds are the largest cohort on Facebook. 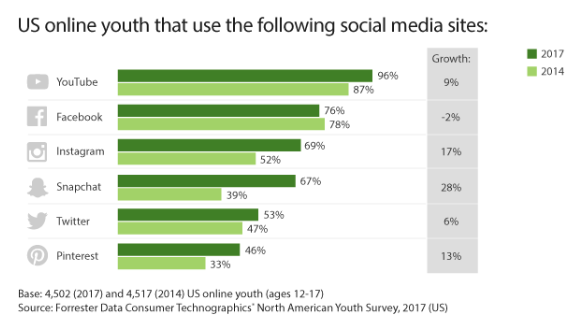 34% of online U.S. teenagers think that Facebook is “for old people,” but 76% of 12-17-year-olds still use the network. 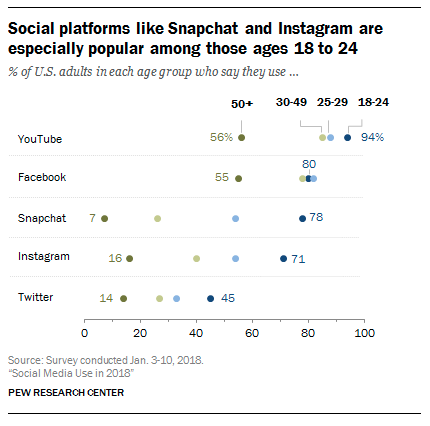 Around eight-in-ten (81%) of those ages 18 to 29 use Facebook in the U.S.
68% of U.S. adults now report that they are Facebook users, of which 75% use Facebook daily. Only about 40% of those 65 and older in the U.S. use Facebook—double what it was in 2012. More U.S. women (74%) report that they use Facebook than men (62%). 73% of U.S. adults who identify as Hispanic say they use Facebook, versus 70% black and 67% white. More than 88% of Facebook’s monthly active users live outside of the U.S.
239 million monthly active users live in the U.S.
17.5% of monthly active users live in Europe (364 million). 38% (794 million) of monthly active users live in Asia-Pacific, the fastest growing region. 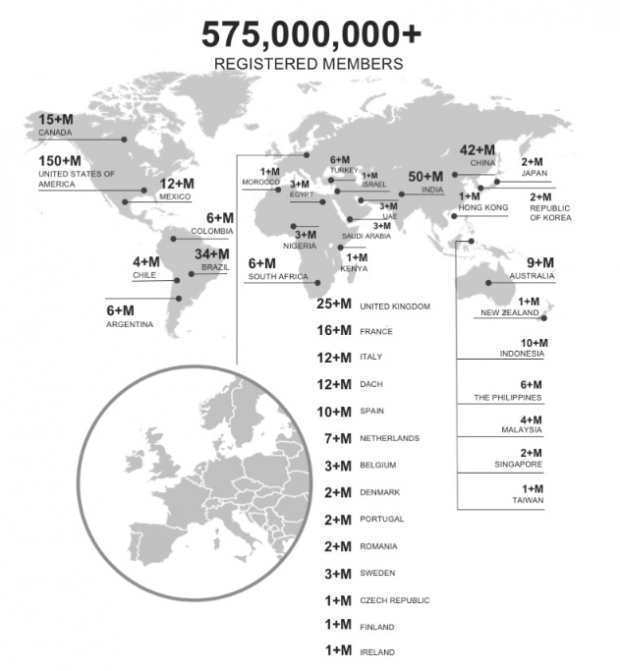 33% (675 million) of monthly active users live in the rest of the world. Most Facebook users in the United States live in urban areas, followed by suburban, and rural. 75% of U.S. adults who use Facebook make $75,000+. 77% of U.S. adults who use Facebook have a college degree or more. These demographics, plus other Facebook statistics and more detailed Facebook demographics, are integral to any smart Facebook marketing strategy. Twitter’s base may be smaller than Facebook’s, but its users are a mighty force, especially when it comes to political engagement. Here are the key Twitter demographic stats marketers should incorporate into their next Twitter strategy. Nearly one-in-four Americans say they use Twitter. 73% of Twitter users in the U.S. also use Instagram. In the U.S., Twitter is most popular with the younger generation. 45% of 18-24-year-olds use Twitter in the U.S., compared with 8%of those 65 and up. The second largest demographic of Twitter users in the U.S. are 25-29-year-olds. Slightly more women use Twitter than men in the U.S. Roughly one-in-four African Americans and Hispanics in the U.S. use Twitter, versus approximately one-in-five white internet users. 68 million monthly active users are located in the U.S.
262 million monthly active users live outside of the U.S. (roughly 80%of all users). Despite the fact that Twitter is blocked in China, it’s estimated that there are more than 10 million users in the country. Twitter users in Africa are five times more likely to use the network to voice their political views. 32% of Twitter users in the U.S. make more than $75,000 a year. 45% of Twitter’s new users have college degrees. Pope Francis is the most followed world leader on Twitter. Want more? 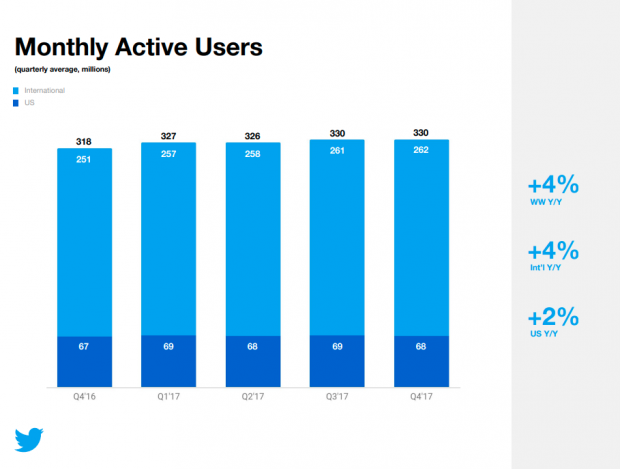 Here are 28 Twitter Statistics All Marketers Need to Know in 2018, plus some more Twitter demographics. Though often overlooked as a social media platform, marketers can’t afford to ignore YouTube. More than three quarters of Americans use the video-sharing site, making it second only to Facebook in reach. YouTube has a global audience of 1.5 billion viewers. That’s almost one-third of all people on the Internet. 94% of 18-24-year-olds in the U.S. use YouTube. YouTube’s adoption rate is growing fastest among teens, passing Facebook to become their most popular social network with this demographic. YouTube reaches more 18-34-year-olds and 18-49-year-olds than any cable network in the U.S.
YouTube is more popular with teenage boys: 85% of boys 13-17-years old watch YouTube daily, versus 70% of girls. 78% of Hispanic people in the U.S. use YouTube, followed by 76%of black internet users and 71% of white internet users. People watch YouTube in 88 countries and 76 languages around the world. 180.1 million people watch YouTube in the U.S.
400 million people in India watch YouTube. The vast majority of YouTube users live in urban areas. 84% of YouTube users make more than $75,000 a year. More than 80% of YouTube users have a college degree or more. Round out your research with these 31 YouTube Stats That Matter to Marketers. Pinterest has a good track record when it comes to conversions. One in two users have made a purchase after spotting a Promoted Pin. But with more than 60 million buyable pins from over 10,000 brands, marketers need to pin down Pinterest’s core demographics to succeed. 200 million people use Pinterest every month. 90% of weekly Pinners use Pinterest to make purchase decisions. 80% of Pinterest users prefer mobile to desktop. One out of every two millennials use Pinterest every month. Pinterest is much more popular with women: Only 30% of its users are men. But, 50% of Pinterest’s new sign-ups are men. 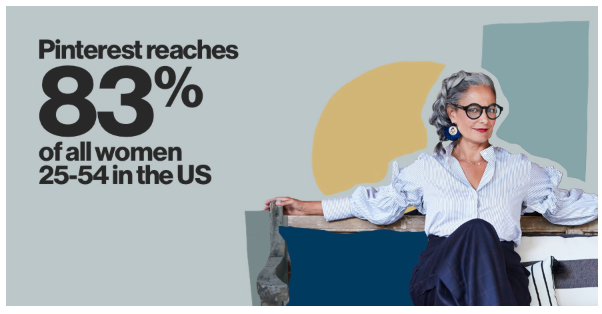 Pinterest reaches 83% of all women 25-54 years-old in the U.S. That’s more than Instagram, Snap and Twitter. Pinterest is more popular among white internet users than among African Americans and Hispanics. 50% of Pinterest users are based outside of the U.S. Monthly active users in Ireland and New Zealand grew by more than 25% in 2016. Pinterest is the only major social platform in the U.S. with a majority of suburban users. 40% of Pinterest users have a household income of more than $100,000 a year. The majority of Pinterest users have a college degree or more. Only 18% of U.S.-based Pinners have high school diploma or less. Here’s an even longer list of Pinterest stats that marketers need to know, as well as more Pinterest demographics. LinkedIn may be the number one site for employers to connect with prospective employees and vice versa. But it’s also a unique platform for marketers to reach one of the most affluent and educated user bases on social media. Make sure you’re familiar with these demographics when crafting your LinkedIn marketing strategy. 80% of LinkedIn members consider professional networking an important part to their career success. LinkedIn is most popular among 25-29-year-olds, followed closely by 30-49-year-olds. Men and women are equally represented on the platform. Fewer American Hispanics use LinkedIn when compared with Hispanic adoption of other social sites. In the U.S., African Americans (28%) members are the largest ethnic group, followed by white internet users (26%). More than 70% of Linkedin members live outside of the U.S.
171 million users are based in Europe, the Middle East and Africa. The U.S. has the largest national user base (146 million members), followed by India, China and Brazil. LinkedIn users live mostly in urban centers, followed closely by suburban areas. 44% of LinkedIn users have incomes over $75,000. 75% of LinkedIn users have incomes of over $50,000. More than 46 million students and recent college graduates use LinkedIn. They are the networking site’s fastest-growing demographic. 50% of Americans with a college degree use LinkedIn, versus only 9% of members with a high school diploma or less. Brands on Snapchat are unlikely to reach the oldest generations. But the ephemeral photo and video-sharing app is where a lot of the cool kids are hanging out. Take these demographics into account when crafting your Snapchat marketing strategy. 77% of Snapchat users based in the U.S. also use Instagram. The majority of Snapchat users are 18-34 years old. 78% of 18-24-year-olds use Snapchat, and 71%of these users visit the platform multiple times a day. Snapchat usage drops off with older generations, with only 54% of 25-29-year-olds using the app. Overall, Snapchat is more popular with women. 42% of 18-29-year-old women have a Snapchat account, versus 31% of men in the same age group. 28% of Snapchat users identify as African American, followed by 31% Hispanic and 24% white. 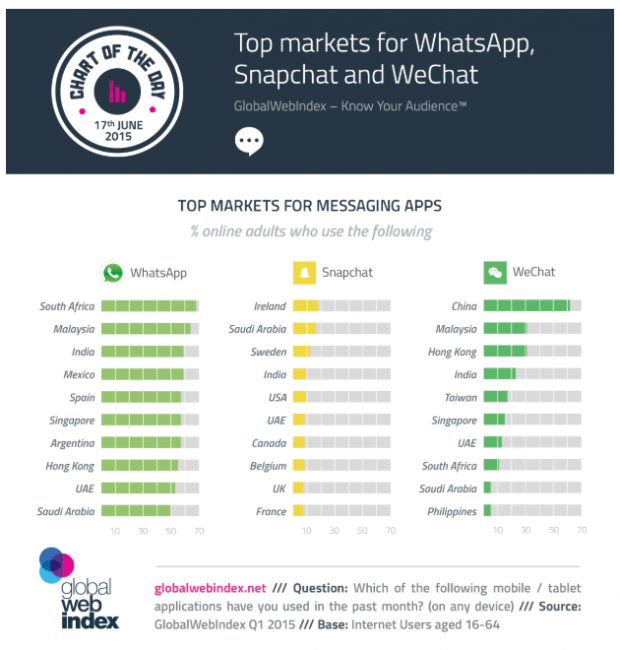 According to the Global Web Index, Snapchat’s top ten countries based on penetration are Ireland, Saudi Arabia, Sweden, India, the U.S., the United Arab Emirates, Canada, Belgium, the United Kingdom, and France. Most Snapchat users live in urban areas, followed by suburban and rural. The majority of U.S. Snapchat users make $30,000 to $49,000 a year. College students are more likely to have Snapchat accounts. Find more Snapchat demographics here. Researching the demographics you’re most likely to reach on social media platforms is essential, but it’s just the start. To take your marketing strategy to the next level, your next steps should involve conducting a social media audit, creating social media goals, and devising a content plan. 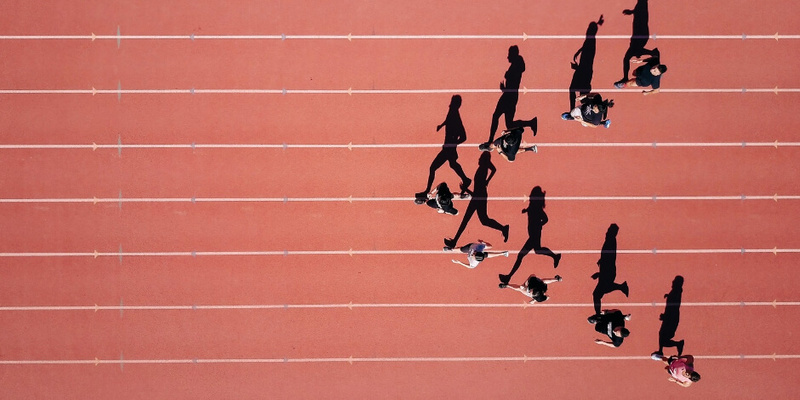 Now that you’ve got the demographic stats you need to plan your social media strategy, use Hootsuite to build and target an audience of loyal followers. Try it free today.